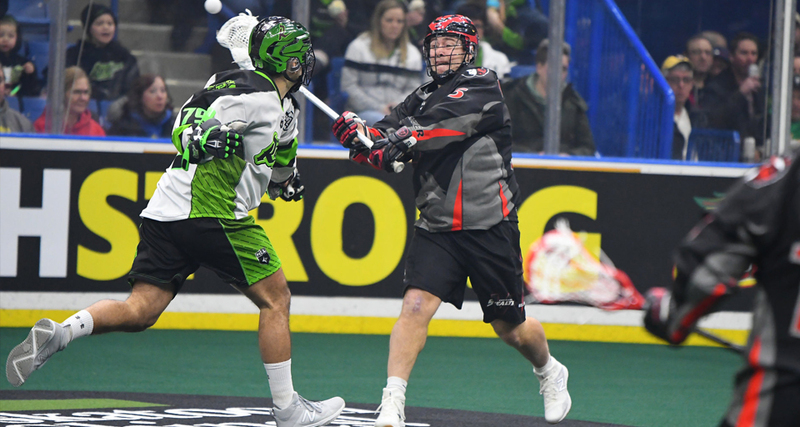 Backstopped by their backup goalie, the western division leading Saskatchewan Rush (7-1) defeated the Vancouver Stealth (1-7) 11-9 on Saturday at the SaskTek Centre. Tyler Carlson made 39 saves in his first start since January 7, 2017. “When you’re the backup goalie, you have to be ready for any situation and I made sure I was ready to go,” said Carlson in a team release. Carlson got his chance in net because it was the second game in 24 hours for the Rush, who had defeated the Colorado Mammoth in Denver Friday night 13-10. Evan Kirk made 39 saves in that victory, more than earning an evening off. Carlson boosted the Rush’s efforts early, stopping 10 straight Stealth chances. His teammates did their jobs on offense, putting up a 3-0 lead after the first quarter. Rhys Duch finally got the Stealth on the board two and a half minutes into the second quarter, opening up some back-and-forth play that took advantage of the Rush’s fatigue. The high-scoring frame saw seven total goals by seven different goal scorers. Saskatchewan held a 7-3 lead at halftime. Logan Schuss made noise for the Stealth as the second half began. After a goal and an assist in the second quarter, Schuss got a helper on a Joel McCready goal to open the third. He then netted one of his own less than three minutes later. The Stealth kept challenging. Schuss added two more goals, including the game-tying tally, as Vancouver tied the game at nine with 30 seconds left in the quarter. But it was Curtis Knight to the rescue for the Rush. With a mere second remaining in the third quarter, his shot off a loose-ball pickup proved to be the game-winner. Carlson held strong in goal in the fourth quarter, while the Rush defense helped him out by blocking shots and playing a good team game to hold the Stealth at bay. “I thought we looked tired in the third, but we found our legs in the fourth,” said Saskatchewan head coach Derek Keenan. Knight added one more goal in the final minutes to pad the Rush’s lead. Despite the loss, Schuss led Vancouver with a four goal, two assist performance. Robert Church had seven points (two goals, five assists) for Saskatchewan.